Lena Chatmon, 21, prepares a meal for her fiance and sister, who live with her in a house in north Tulsa. Chatmon said potential employers were turned off by her criminal record. Like many other Oklahomans who have a criminal conviction, Lena Chatmon has struggled to rebuild her life since pleading guilty to motor vehicle-related and larceny charges in 2017. 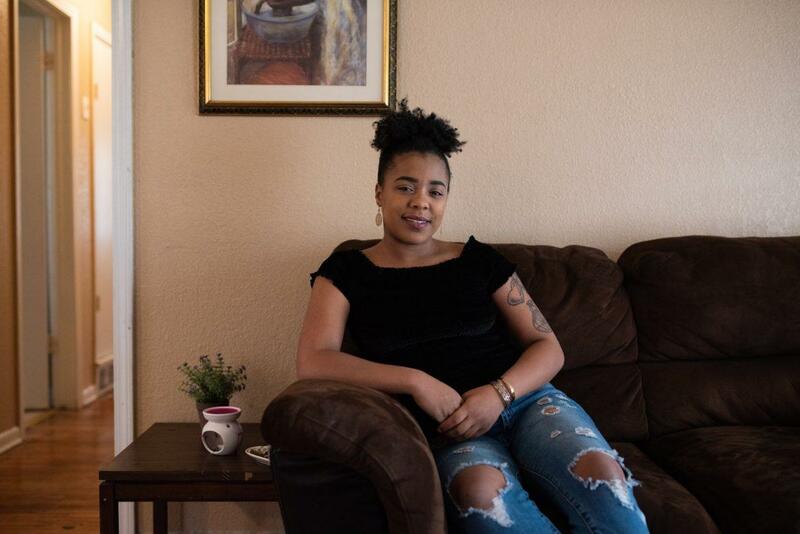 Chatmon, 21, who lives in Tulsa, is unemployed and said many employers are reluctant to hire her because of her criminal record. But as she continues to look for a job while on probation, she faces a new worry: the risk of losing her health insurance if a state proposal is approved that requires many Medicaid recipients to work at least 20 hours a week. Thousands of Oklahomans could find themselves in Chatmon’s situation if the federal government accepts Oklahoma’s request to link a work requirement to eligibility for SoonerCare, the state’s Medicaid program. Former Gov. Mary Fallin and the Legislature requested the rule last year in an effort to reduce Medicaid costs and ensure the program is serving only those who need it the most. The waiver application, which the Trump Administration could accept or reject this year, does allow exemptions for recipients who are under 19, pregnant, students, medically unable to work or are a parent or caretaker for a child under 6. The proposal also includes a nine-month grace period starting when a felon is released from incarceration. But there are no exemptions for others. The Medicaid rule alarms criminal justice reform advocates, who say the work requirement would jeopardize ex-felons’ health and their ability to find and perform work. Historically, ex-convicts have suffered from high unemployment rates, poverty and physical and mental illness. The state Health Care Authority estimates that of the 102,000 adult SoonerCare recipients between 19 and 50 years old, about 6,000 would not be covered by any exemptions if the work requirement takes effect next year. A report from the Georgetown University Health Policy Institute puts the number higher, stating between about 4,400 and 12,600 would lose coverage and the number “would grow over time,” especially in rural areas. Even many of those exempt from the work rule could lose coverage by failing to file documentation proving compliance, the report says. The report found the work requirement would affect low-income mothers most of all, since 80 percent of people subject to the rule would be women with children. Dolores Verbonitz, a program manager for the Community Service Council’s Tulsa Reentry One-Stop program, said this is a concern because Oklahoma leads the nation in incarceration rates among women. She said her group routinely works with women who have children and depend on Medicaid. In many cases, they have children who are 6 or older, which would make the parent ineligible for a work-rule exemption. Verbonitz said losing Medicaid could trigger other problems for those with criminal records, including less or no help with addiction or mental-health issues and more extreme poverty. Many employers of low-income workers don’t offer affordable health insurance. With less help, many women could re-offend and end up back in prison. Lena Chatmon, of Tulsa, 21, said prospective employers are more interested in hiring her when they learn she has deferred sentences on her criminal charges. Data on the impact of the work requirement in other states is just starting to trickle in. Since last year, the federal government has approved the work rules for only six states – Arkansas, Indiana, Kentucky, Michigan, New Hampshire and Wisconsin. In Arkansas, the first to implement the new rules, more than 18,000 people were kicked off Medicaid between September and December because of the work requirement, according to a Kaiser Family Foundation report. But like the five other states, Arkansas has at least partially expanded Medicaid to cover thousands of low-income adults who otherwise make too much to qualify for the program. The Georgetown report noted that because Oklahoma hasn’t expanded Medicaid, the work requirement would affect only those with incomes at or below 45 percent of the federal poverty level, meaning they earn less than $4,156 a year. If its waiver is approved, Oklahoma will become the first non-expansion state to add the work rule. More than 800 groups or individuals submitted public comments on the state’s waiver application. A large majority opposed the work requirement, saying it would make Oklahomans less healthy. But state officials say the opposite is true. The Health Care Authority’s waiver application contends that by disincentivizing unemployment, “Oklahoma could impact employment rates and improve health outcomes.” It said the correlation between the two is well-established. Republican lawmakers, who passed a bill directing Fallin to seek the Medicaid waiver, have said the proposal is needed from an economic standpoint. Proponents say they were careful to exempt groups of people who can’t work. Health Care Authority spokesperson Katelynn Burns said the agency held several public meetings last year to hear feedback on who should be excluded from the rule. John Pearson, who chairs the Oklahoma Partnership for Successful Reentry, said the grace period wouldn’t likely help the many ex-felons who rely long-term on sporadic work; they would have trouble meeting the 20-hours-per-week requirement. Various studies have found that one year after release from prison, as many as 60 to 75 percent of former inmates remain unemployed. Pearson called the proposal a “travesty,” saying the rule could at least erode Oklahoma’s criminal justice reforms that seek to lower the state’s chronically high incarceration rates. On Wednesday, Gov. Mary Fallin signed into law emergency medical marijuana rules, including two controversial amendments approved by the state board of health earlier this week.